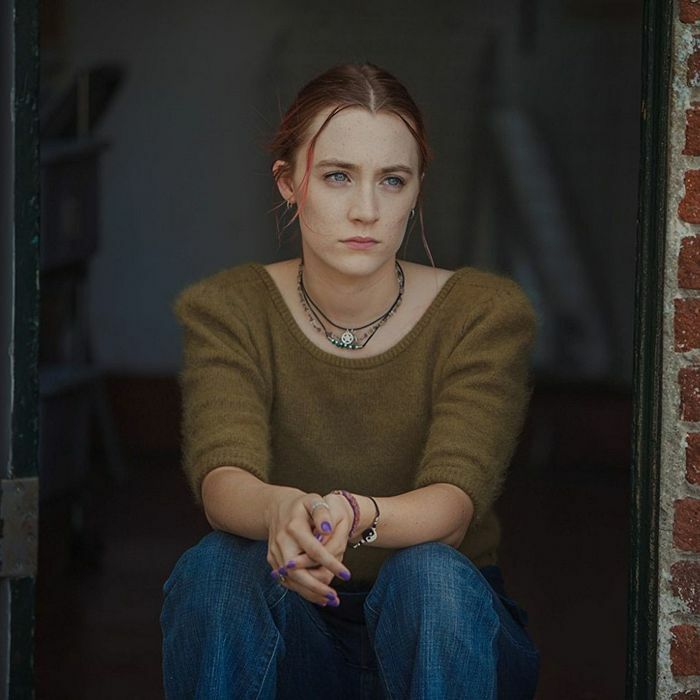 Everything comes together for Greta Gerwig in her marvelous solo directorial debut, Lady Bird, in which Saoirse Ronan plays a Sacramento 17-year-old named Christine McPherson who adopts the titular nom de guerre as a way to launch her own flittery persona. It’s a flittery movie, too, but with soul: Gerwig has a gift for skipping along the surface of her teenage alter ego’s life and then going deep — quickly, without fuss — before skipping forward again, evoking the tempo of a life lived whimsically but over an emotional abyss. You’ll recall the flittering persona from Gerwig’s collaboration with Noah Baumbach Frances Ha, in which she played the title role. Greta Gerwig playing Greta Gerwig is Greta Gerwig squared: ecstasy for some, too much adorkability for others. You would never call Saoirse Ronan adorkable. She’d break your nose. Her Lady Bird is big, at times theatrical, but there’s no eye-rolling or face-pulling, no mixing up the character’s exhibitionism with her depth of feeling. Ronan’s accent is American, but there’s Irish in her rhythms, in the way she drives her lines home and turns every full stop into an ellipsis, a fierce demand for more. Central to Christine/Lady Bird’s ongoing crisis of identity is her mother, Marion (Laurie Metcalf), who has to work more and more hours as a nurse when her husband, Larry (Tracy Letts), loses his job. One moment, mother and daughter are tight, weeping in the car over an audio book of The Grapes of Wrath (! ); the next, Marion has turned on Lady Bird, pouring all her anxiety and self-doubt into her daughter’s head to the point where the girl throws herself out of the moving car. The best comic writers maintain a sense of danger, of what might have been, but there’s too much generosity in Gerwig’s writing to let her characters fall too hard. Diana, a classmate, comes on like a grating caricature, but as she chatters away about a teacher’s dead son (“Maybe it was a suicide. My mom says same difference if you’re that careless with your life”), you understand the chill familial worldview behind her flipness. Timothée Chalamet — stunningly good in the coming-of-age gay love story Call Me by Your Name — plays Kyle, the too-cool, physically uncommunicative high schooler whom Lady Bird takes up with after an earlier fling explodes. Kyle has a whole philosophy worked out: “I don’t like money, so I’m trying to live by bartering alone.” The great Lois Smith as a nun with a sense of humor is icing on the fruitcake. Gerwig gives us just enough Laurie Metcalf to keep us wanting more. A scene in which mother and daughter look at a fancy house, pretending to be rich, suggests the rapport that they might have had without their financial anxieties, and sets up a rupture that can never fully heal. Even at the most scalding of Marion’s rebukes, Metcalf shows the confusion underneath — of a woman whose resentment has spun away from her and taken on a life of its own, to the point where halting it could seem even more painful than giving it free rein. A final sequence in New York is so inspired that I’d call for a sequel if that weren’t so dully de rigueur these days. In the case of Lady Bird, enough is enough — in fact, nearly perfect.